PatMcGrath has always been an inspiration for me and the only runway make-up artist which I admire the most as we share the same ethos of experimenting with colours and constantly pursuing the "unusual". She is unafraid of pushing boundaries within means, and embodies the spirit of Unlikely You, constantly evolving, unafraid of mixing, experimenting and dabbling with the known and unknown. Since the early nineties, the brains behind her own label PatMcGrath Labs has been influencing top fashion designers like John Galliano and Alexander McQueen from backstage to the forefront with the power of her creativity and artistry - transforming otherwise boring black and white or classic runway pieces into fascinating and bizarre works of art. Pat inspires me and many others with her no-holds barred, freestyle way of using her fingers instead of professional brushes to magically transform supermodels' faces from plain canvasses into beautiful artworks. Till this very day, I go between professional make-up brushes and using my fingers to create the perfect looks for day or night. Although make-up brushes are precision tools for make-up artists and beauty lovers, they can never be replaced with the technique of using fingers especially when blending products into the skin or picking up the maximum amount of color pigments comes into question. In her latest makeup collection release due for September 16 at midnight, Eastern time, Pat McGrath's Mothership eyeshadow palettes will be the first of her permanent collection alongside with MatteTrance, LuxeTrance lipsticks, PermaGel Ultra Glide eye pencils, PermaGel Ultra Lip Pencils and a Dark Star mascara. Dark tones in mainly blues and purples. Basic shades of monochrome and base colors to suit every skin tone. Verdict: The most exciting palette of them all in terms of variety of colours, still very dark and subdued shades such as deep purple, prussian blue and gold, no doubt the purported shiny foil effect of the eyeshadow. We are thrilled that Pat has finally found the right time to launch her very own permanent line and cannot wait for it to expand in its extraordinary ways. Here's why we think PatMcGrath's Mothership eyeshadow palettes pack a punch or not. You decide. 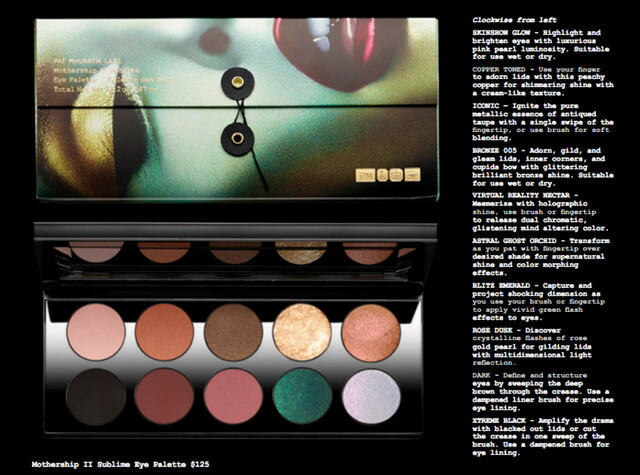 A closer look at the Pat McGrath permanent collection eyeshadow palettes from @Patmcgrathreal's instagram account. The shades look a lot brighter under heavy spotlight. At 125USD a pop, these eyeshadow palettes are pretty heavy investment pieces. We are not sure how the formula works so we can't comment on the performance yet. It looks amazing in videos but we're not so sure in terms of staying power, product fall-out, ease of application, actual color saturation amongst other consideration factors. There are pretty basic colours made more interesting with a few really shiny/ glittery/ metallized ones in each palette. This is a common tactic of introducing an eye-popping shade or two in an otherwise neutral palette. With a brand name like PatMcGrath, the maven could easily choose any famous photograph like Glen Luchford who was commissioned for Gucci's Pre-fall 2017 campaign or a mainstream graphic design artist with half a million followers on Instagram. However, but that would not bring out the true rawness and soul of creativity in the one big personality that she is. 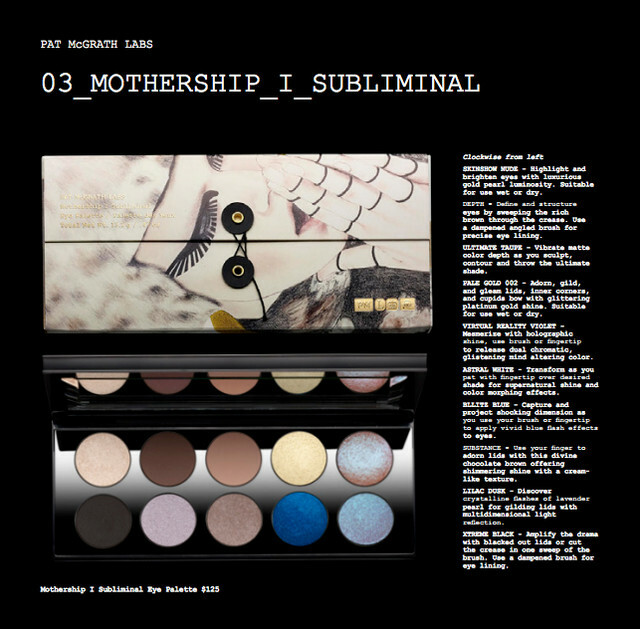 We hope the graphic designers, illustrators, make-up and conceptual artists will be given full credit and recognition not just on Pat McGrath's instagram account but on her website, contracts and other publicity channels. 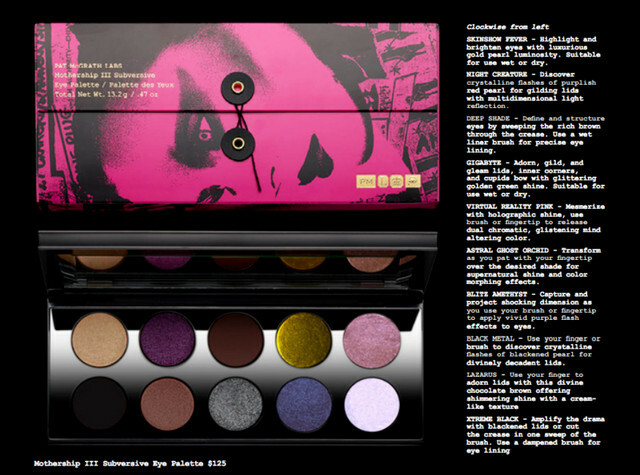 The surreal, one-of-a-kind artwork and design on Pat McGrath's beauty packaging for her latest unlimited make-up collection is from the following talented people.